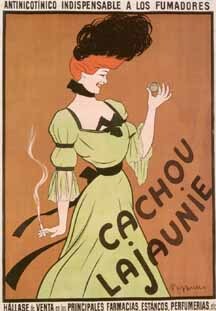 This Cappiello's first poster for Lajaunie breath freshening pastilles ( " indispensable for smokers"). His early style of flat planes and colors, drawing from his experience as a caricaturist, is very different from the dimensional design in the second poster, done 20 years later and printed by Devambez in Paris. The client, Mr. Lajaunie, wrote to Vercasson, "When you submitted the maquette of my poster by Cappiello, I simply told you I was satisfied. Today [a year later] I appreciate it better still for the originality of the design and the happy choice of colors. This poster has truly contributed to the increasing success of my candies. In France and abroad, numerous collectors have asked me for a copy, which proves to me the favor this poster has garnered among the public and among connoisseurs"